Important Note Regarding Toner Scams: Campus departments should be advised of scam marketplace activity regarding toner products. Scam toner companies commonly target areas within universities, government agencies, or other large organizations. Read more. 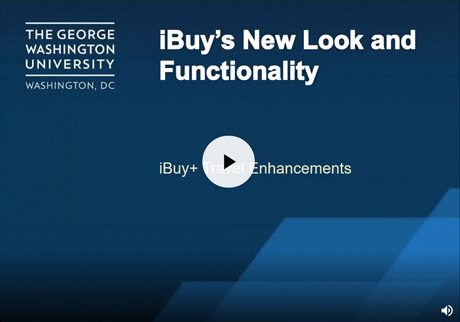 The George Washington University's iBuy+ system provides an efficient and user-friendly one-stop shop for ordering GW's most commonly purchased products, travel booking, P-Card allocation and employee reimbursement. This video walks you through iBuy+ Expense Reporting Enhancements, including a new look and improved functionality. See Helpful Tips! Check out the list of iBuy vendors on the Vendor A to Z List , including new recent additions!